It was the destruction of the Crusader army by Saladin at Hattin in 1187 that had led to the collapse of the Crusader kingdoms in the Levant, including the loss of Jerusalem. Guy of Lusignan, the erstwhile ruler of the city, appealed to the Europeans for aid, which soon arrived. But without waiting for the three main Crusader armies — led by King Philip of France, Emperor Frederick Barbarossa, and Richard I of England ­— Guy set out to capture Acre on the Levantine coast. His first assault was repulsed and Guy settled in for a siege. Meanwhile, Saladin gathered a portion of his army and rode in to lift the siege. After preliminary skirmishing, the opposing armies met east of the city on 4 October. 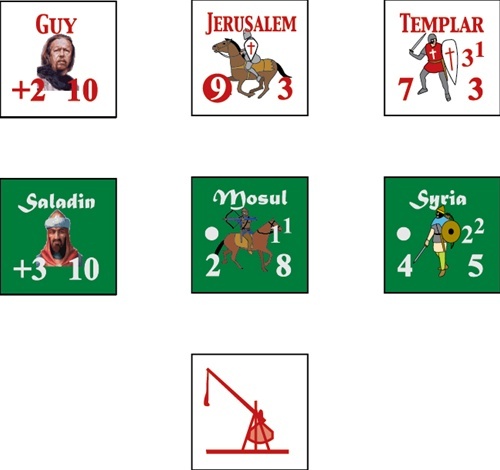 Acre uses the new Battles of the Medieval World system, a variation on the venerable Battles of the Ancient World system. The battle is dominated by masses of heavy cavalry and disciplined lines of heavily-armed and armored men-at-arms. Swirling around these forces are masses of foot- and horse-archers, whose purpose is to disrupt the heavy formations and make them easy prey for their counterparts. 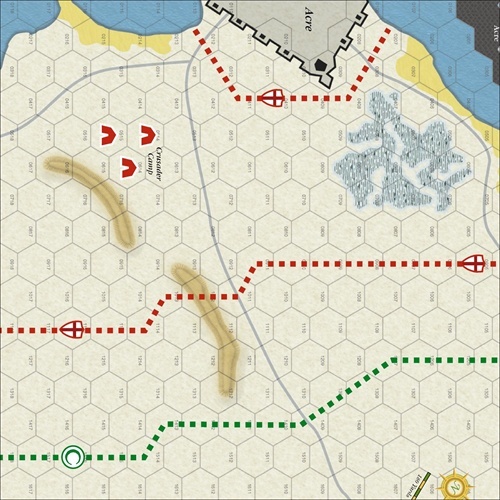 Using the classic Combat Results Table, the fighting is close and bloody until the morale of one side weakens. Once a line breaks, the victor must pursue ruthlessly to prevent a rally. Leaders enhance combat power and restore broken formations. 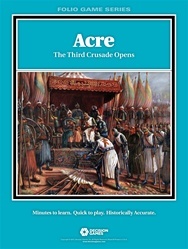 At Acre, the Crusaders have more combat power, but must maintain a long line to protect their siege works. The Arabs are quick but light, and must find a way to isolate portions of the Crusader army and defeat it in detail. Victory will go to the player who deploys his army to best utilize his strengths and take advantage of enemy weaknesses.